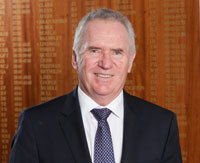 Allan Border AO, or AB as he is more affectionately known, is a former Queensland and Australian cricketer. As the 38th captain of the Australian team, Allan captained the side on 93 consecutive occasions and still retains the world record for the number of consecutive Test appearances at 153. Allan played 98 first-class matches for Queensland, in addition to his 156 Tests for Australia, scoring 7661 first-class runs for the state at an average of 57.17. As captain, Allan rebuilt the national side through one of the toughest periods in history and claimed the nation’s first World Cup in 1987. Allan led Australia to the 1989 series win in England when they reclaimed the Ashes 4-0, the first time since 1934 that Australia had regained the Ashes in England. Allan scored 11,174 Test runs for Australia, a world record at the time, and was an inaugural inductee into the International Cricket Council Hall of Fame. The Honourable Dame Quentin Bryce AD CVO has broken down countless barriers as an advocate for human rights of women and families. Perhaps best known as Governor of Queensland and then becoming Australia’s first female Governor-General, Ms Bryce was the first woman to be appointed as a faculty member of The University of Queensland Law School. With a lifetime of public service, Ms Bryce has been a member of the National Women’s Advisory Council and Queensland Director of the Human Rights and Equal Opportunity Commission. In 2015, Ms Bryce completed the landmark Not Now, Not Ever: Putting an End to Domestic and Family Violence in Queensland report that shone a light on the complex cultural problem of domestic and family violence in Queensland. Dame Quentin also showed her commitment to reform by chairing the Domestic and Family Violence Implementation Council. 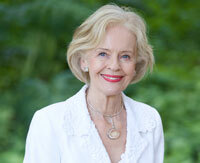 She has been an inspirational figure for many decades, especially for Queensland women. She has long championed the rights of all Australians and sought to redress injustice wherever she found it. 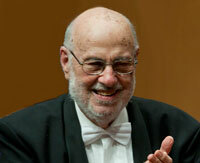 John Curro is the founder and Director of Music for the Queensland Youth Orchestra and has conducted the Queensland Youth Symphony since it began in 1966. In demand as a conductor and tutor for professional and youth orchestras and festivals, John has conducted many of Australia’s professional orchestras, as well as many opera and ballet seasons in Australia. John’s guest conducting appearances include the London Virtuosi, Shanghai Philharmonic Orchestra, Australian and Bavarian Youth Orchestra, Bangkok Symphony Orchestra, and Principal Guest Conductor with the Christchurch Symphony Orchestra. He has Honorary Doctorates from the university of Queensland and Griffith University and has received many prestigious awards including the Member of the Order of Australia and Member of the British Empire. Lloyd McDermott (Mullenjaiwakka) is an inspirational athlete, barrister and philanthropist. This trailblazing Waka Waka man was Australia’s first Indigenous athlete to play for the national rugby union team, the Wallabies. Lloyd’s sporting and academic ability saw him awarded a scholarship to a prestigious Brisbane school. 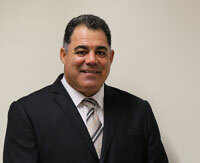 While in the midst of his sporting career, he went to study law at The University of Queensland and was admitted to the Bar in New South Wales in 1972, eventually becoming Australia’s first Indigenous barrister. 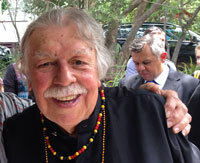 Throughout his career, Lloyd has devoted his time and energy to promoting opportunities for young Indigenous men and women, as founder of the Lloyd McDermott Rugby Trust. He also established the Lloyd McDermott Rugby Development Team, in association with the Australian Rugby Union, to introduce the game to young Indigenous men and women across Australia and foster their personal development. The Royal Society for the Prevention of Cruelty to Animals (RSPCA) Queensland is the state’s oldest, largest and leading animal welfare charity, dedicated to improving the lives of all domestic, farmed and native animals in Queensland. With a dedicated army of staff and volunteers, RSPCA Queensland rehomes and reunites more animals than any other organisation in Australia. The society has nine animal care centres, 23 full-time inspectors and 10 ambulance officers, a domestic veterinary surgery, a wildlife veterinary surgery, an animal training centre and an education department that includes a Mobile Education Unit (EMU). The EMU travels through the State and beyond, reaching over 100,000 people a year through school visits and appearances at country shows. RSPCA Queensland also has a foster care program with over 1500 foster parents on its books and a Pets in Crisis program that looks after pets of people who have suffered from domestic violence. 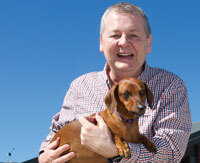 In 2015, more than 45,000 animals passed through the care of RSPCA Queensland. George Roberts CBE was a pioneer and visionary for North Queensland. 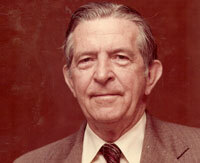 George’s contributions to Townsville and Queensland, as a regional activist, were many, including his vision for Townsville as a regional economic centre at a time of centralised government. George was Townsville’s Deputy Mayor from 1963–67 and oversaw the construction of James Cook University from 1964. In the midst of developing the university, George committed himself to another lifelong project, the development of a suitable regional hospital for the chronically ill and aged. In 1969, George became Chair of the Anglican Diocese of North Queensland, the project’s steering committee. He selected the site shortly thereafter for what would become Good Shepherd Hospice for the chronically ill. George was an extraordinary fundraiser, known ‘to turn lead into gold’ and, for 22 years, brought together the Anglican churches of Townsville, Ayr, Home Hill, Bowen, Mount Isa, Ingham, Cloncurry and Charters Towers to raise funds for the hospice.